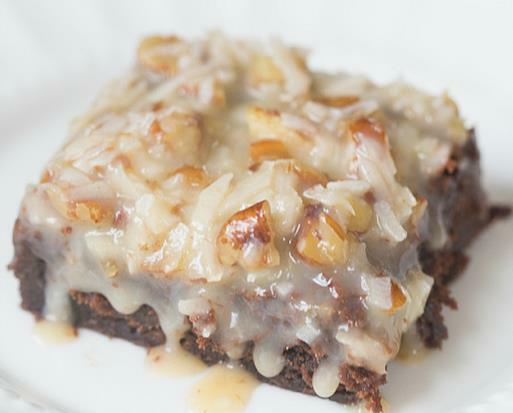 GERMAN CHOCOLATE BROWNIES FOR GERMAN CHOCOLATE CAKE DAY JUNE 11! | Cook, Party, Enjoy! GERMAN CHOCOLATE BROWNIES FOR GERMAN CHOCOLATE CAKE DAY JUNE 11! Did you realize today is National German Chocolate Cake Day, June 11, 2014. Who Knew? First I discover Donut Day and now this. Clearly there is a day for everything. And to answer that question I Googled Food days and there is a whole list of them. So I am going to post the days as a page and on those special days I will make sure I post MY BEST recipe to celebrate! I believe it will be fun! Don’t hesitate to send me your favorite recipes for those special days too. If you said false, you’re correct! This decadent cake is actually named after Sam German, who developed a baking chocolate in 1852 for Baker’s Chocolate Company which combined the sugar and the chocolate to save bakers time and they named the chocolate “German’s Sweet Chocolate” in his honor. It is said that a chocolate cake recipe using “German’s Sweet Chocolate” was published in the Dallas Morning News in 1957 by a Mrs. George Clay. After the recipe appeared in the paper and was syndicated across the country, sales of “German’s Sweet Chocolate” increased dramatically. People loved the different taste that “German’s Sweet Chocolate” offered and clamored for the confection. Eventually Baker’s dropped the apostrophe s and the chocolate and cakes and brownies made with it were known a German Chocolate. The caramel coconut pecan frosting/filling came later. In celebration of this Momentous occasion I offer this German Chocolate Brownie recipe instead of the usual German Chocolate Cake. These brownies are my favorite because they are cake like but chewy. Adding the pecan-coconut-caramel frosting just takes them over the top. Adjust oven rack to lowest position and heat oven to 350 degrees F. Line a 9×13-inch baking pan with foil, leaving about a one-inch overhang on all sides. Spray with nonstick cooking spray. Whisk cocoa and boiling water together in large bowl until smooth. Add unsweetened chocolate and whisk until chocolate is melted. Whisk in melted butter and oil. (Mixture may look curdled.) Add eggs, yolks, and vanilla and continue to whisk until smooth and homogeneous. Whisk in sugar until fully incorporated. Add flour and salt and mix with rubber spatula until combined. Scrape batter into prepared pan and bake until toothpick inserted halfway between edge and center comes out with just a few moist crumbs attached, 30 to 35 minutes. Transfer pan to wire rack and cool to room temperature. Stir together the heavy cream, sugar and egg yolks in a medium saucepan. Put the butter, salt, pecans and coconut in a large bowl and set aside. Heat the cream mixture and cook, stirring constantly (scraping the bottom of the pan as you stir) until the mixture begins to thicken and coats the back of a spoon (an instant-read thermometer will read 170 degrees F). Pour the hot custard immediately into the pecan-coconut mixture and stir until the butter is melted. Cool completely to room temperature. Once cooled to room temperature, refrigerate for 1 hour. Spread the chilled German chocolate topping over the top of the brownies and refrigerate for an additional 1 hour. Using foil overhang, lift brownies from pan. Cut into squares and serve. Brownies can be stored in an airtight container in the refrigerator for up to 4 days. ← USING THAT COULD KILL YOU!